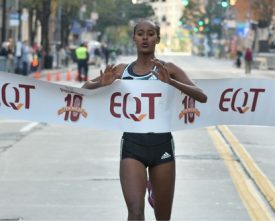 PITTSBURGH – For the first time, the EQT Pittsburgh 10 Miler will host the PRRO Championship race, set for Sunday morning, November 5. At the 5th edition, a top international field, including four PRRO Circuit 2016-17 event winners, will be vying for the PRRO crown, a $26,200 race purse and $5200 U.S.-only money as well as the $10,000 PRRO Super Bonus and PRRO Event Champion’s Bonus money in the City of Champions. At the 22nd PRRO Championship, reigning champions and any athlete who has won one of the 2016-17 Circuit events are eligible for the $10,000 PRRO Super Bonus, which is awarded to the winner of the 2017 PRRO Championship (split if an eligible male and female win the PRRO titles). Those aforementioned runners are also eligible for the PRRO Event Champion’s Bonus ($1500 cumulative for eligible athletes who do not win the PRRO Championship but do win Open prize money at the PRRO Championship). Any athlete who wins the PRRO Super Bonus is not eligible for the PRRO Event Champion’s Bonus. Below are the $10,000 PRRO Super Bonus & Event Champion’s Bonus qualifiers for the 2017 PRRO Championship presented by the EQT Pittsburgh 10 Miler. Those four athletes entered in the PRRO Championship are noted with an asterisk. The PRRO Circuit 2016-17 opened on November 6, 2016 at the annual fall Steel City road race. The PRRO Circuit showcases world class competition at 4 classic American road race events shorter than the marathon distance and features more than $260,000 in prize money overall with $74,900 available for U.S. athletes. To-date, PRRO Circuit events have produced 17 world and 17 U.S. road records, awarded more than $7.1 million in prize money and seen more than 2.3 million runners cross their finish lines. In addition, since 1996, the PRRO Championship race has paid out more than $1.7 million including $121,500 in PRRO Championship bonus money. In February 2017, the Publix Gasparilla Half Marathon in Tampa, FL joined the PRRO Circuit 2017-18 to become the 5th Circuit event member. The Credit Union Cherry Blossom Ten Mile will host the PRRO Championship 2018 on Sunday, April 8.